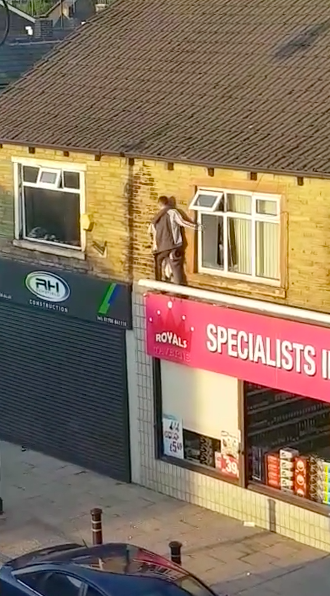 A video has gone viral on Facebook of a thief falling out of a window while he attempts to escape from the shop he tried to rob. 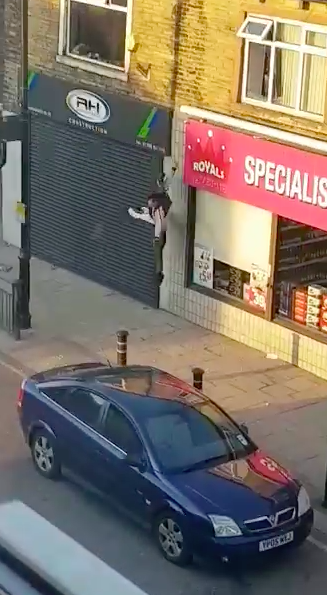 In the footage a young unknown man can be seen breaking a window above the Royals Taverns Ltd. store on Market Street, Oldham, Greater Manchester, after the shop assistant locked him in. Searching for a way to escape, the man ran upstairs, smashed the window open and climbed out of it before crashing ungracefully to the ground. Jonathan Lignum, 43 years old, witnessed the incident from his friend’s flat, opposite the shop, on the evening of Thursday May 24. When he shared the video on Facebook in June, it quickly went viral receiving, at time of writing (June 27), over 42,000 views. I was in my friend’s flat when I noticed the blinds of the upstairs window in the shop moving around. Then I saw this lad struggling to get out. I got my camera and started filming. He then kicked the window through, climbed out over the shutters then fell off trying to get down. He broke his arm, I know people who know him and they told me. I was surprised how careless he was and couldn’t believe what was happening. The shop assistant had rang the police and locked him at the back of the shop so couldn’t get away. The police arrested him at the tram station soon after. 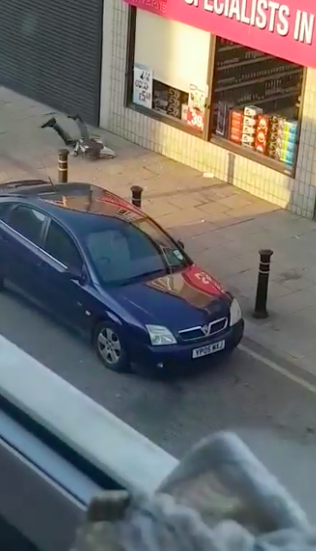 UNILAD contacted Greater Manchester Police but they were unable to comment on the incident. The manager of Royals Taverns confirmed the man was locked in after attempting to rob the store and was caught by the police. They were unable to verify whether the man had broken his arm in the fall. Earlier this year another thief broke her leg while in the middle of stealing several packages from a doorstep. 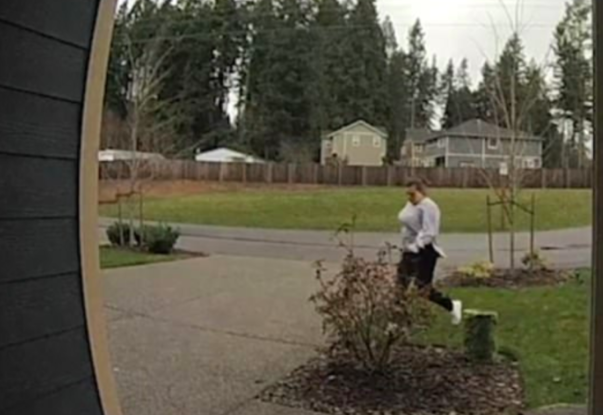 Footage caught on a home security camera in Snohomish County, Washington, shows an UPS delivery driver dropping off three parcels at the side door of a property. Noticing the unguarded parcels while driving past in a black car, the thief jumps out of the vehicle, runs up to the house and steals them. However, while carrying the goods and attempting to make a quick get away the woman slips on the wet grass, breaking her leg in the process. It is almost as if the world knew what she was up to and decided to give her what she deserved. Her male accomplice is then seen jumping out of the car to help even carrying her back to the vehicle. Unfortunately the pair got away but the local county sheriff’s office is currently investigating the theft. Still, both the parcel and shop thieves got the karma they deserved!